Yes, we started another batch of Sauerkraut…our 3 batch this season. 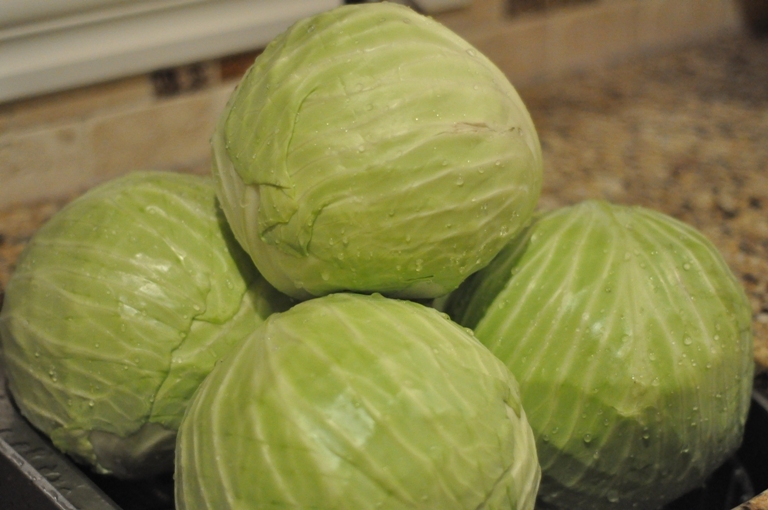 When we realized that Ontario cabbage was only 5o cents for a large head how could we say “no”. so, for $2.50 we will be able to jar at least 6 x 1 litre jars of this oh so tasty kraut. Making sauerkraut really is as easy as slicing some cabbage and remembering to skim the foam daily for 4-6 weeks…no big deal. And, I leave the big 4 gallon crock right on the kitchen counter to remind me. Now, that we are keeping our homes a little toastier for those colder winter months it may not even take 6 weeks…we’ll see. For the recipe go to this older post ~ Making Sauerkraut Batch One. This batch was started on Friday and should be ready to jar, by the latest, on December 23rd. Just in time for Christmas. And, it is so good with “road kill sausages”. Here is was it looks like after 2 days. As you can see the liquid is all the way to the top and it is bubbling…yes, successful fermentation! Now, to keep our home above 70 degrees. 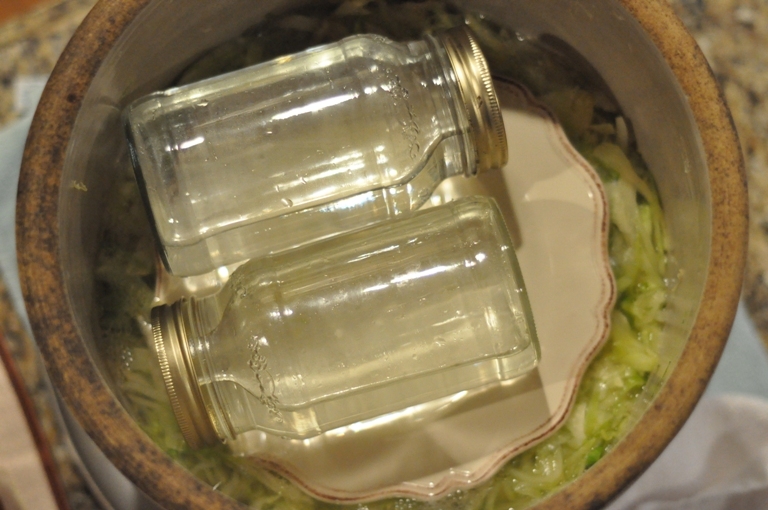 We use a plate weighted with two jars filled with water to keep the cabbage submerged in its own juices. I need to find a bigger plate but this one is doing the trick for now. Wow, that is so inexpensive for cabbage! I have to find some crocks so I can try to do sauerkraut one day! I love kraut!